To get a card or learn more about a particular one, click on the card in the home tab. That will allow you to see the price (if any) and see if the card is sold out yet. Make sure you unlock Metamask and then click on the “Buy” button. A confirmation window will pop up in your browser asking if you really want to send the transaction. The most important thing to note here is the Gas Price. Although they are working on improving, MetaMask sometimes shows a price that’s way too high. It’s always a good idea to go to www.ethgasstation.info. You can confidently send for the “Safe Low Gas Price.” Adjust the number in MetaMask and then click send. The Gas Price varies depending on how many people are trying to use the network and what they are willing to pay. You can pay more to get your transaction sent sooner, but if you can wait 2–3 minutes you can usually get it for much less. Of course, you can also claim cards by interacting with the contracts directly (advanced). Finally, go to the My Team page to see your new addition! 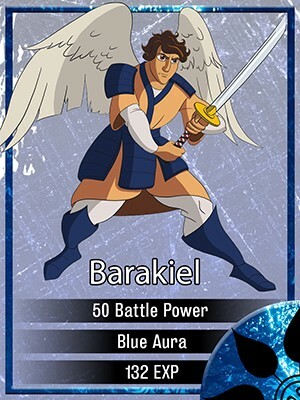 Angel Cards — Everyone needs at least one Angel Card in order to either train or enter a battle. However, the more cards you have, the more versatile your team will be and you will have a much easier time breeding pets, domesticating wild pets, defeating monsters and other players, and earning a spot on the leaderboards. Breakiel can play all aspects of the game, but is also limited in how much his Experience can grow. The first angel, Berakiel, the Angel of Lightning, is free to everyone and will remain free until 50,000 have been given out. Zadkiel, Lucifer and Micheal are available from the start of the game for a price that will always be fixed. They will remain available until all 250 of them have been sold. The other 20 angels will be released on a schedule of one angel every 5 days. One of the domestic pet cards. The name “Mr. 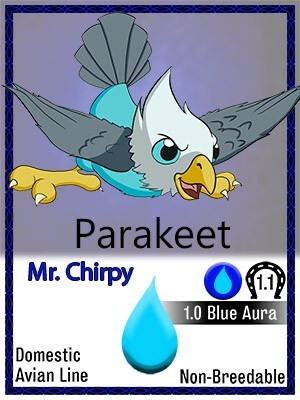 Chirpy” is given by the card owner. Pet Cards — Domestic pets can be acquired for free according to a delayed release schedule. More powerful pets must be acquired by breeding, capturing wild, or from other players in the Marketplace. 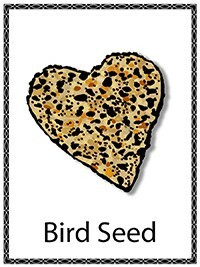 Accessory Cards — Accessories are OPTIONAL, but you can gain some powers or attract wild pets more easily. All accessory cards are available from the beginning of the game, but there are only 250 total of each card available. Once they are gone, the only place to get them will be from other players in the marketplace. 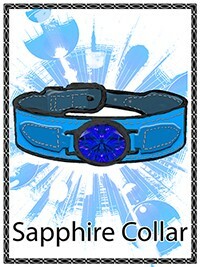 The Sapphire Collar greatly enhances your pet’s blue Aura power.